Visiting Kerry to find your ancestors? To-day I would like to give a few hints to any Kerry descendants who have an idea or who are even at the planning stage of coming to Kerry to walk in the footsteps of their ancestor who emigrated from there, probably in the 19th century. I get a large number of online enquires from the United States, Australia New Zealand and Canada from great and great-great grandchildren of Kerry emigrants who are passionate about visiting, finding the ancestral home if possible while here and ‘walking the land’ where their forefathers were born and reared before leaving, never to return. Many descendants have done some research, many have done no research but all have the same impression – that somehow there are records in Kerry that will allow them to find the elusive family and associated townland. This year in particular, I have had a number of emails from descendants arriving in the next week and hoping that all will be revealed during the visit. This is not the case and I hope this blog to-day will set the record straight. To-day I want to give you an example of the right way to go about this. 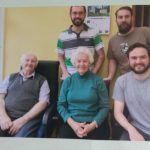 Peggy Nute whom I will quote, has given me permission to record her research and visit which was very successful – what every genealogy visitor would like to achieve. Peggy initially contacted me last March asking me to take on a commission to trace her grandfather John Fitzgerald. She had very little information except an older relative had stated that ‘John Fitzgerald was from Cty Cork and came to the USA as a young boy of 14-15’. However his marriage certificate 20 Sept 1866, when he married Frances Ellen Barnett in Charleston, Mass., stated that his parents were listed as William Fitzgerald and Mary Connors from Ireland’. Peggy believed herself that ‘all family records point to the fact that he was from Tralee and born Sept 1845’. I started by accessing baptismal records for Counties Cork and Kerry but I also took on board the fact that the (a) port of embarkation in 1860 could have been Queenstown and many descendants looking at shipping records assume incorrectly that Co. Cork is the home location of all passengers and (b) the date of birth recorded at death is never exact – it could change by up to as much as 8 years. After an exhaustive search of both Irish and U.S. records and much emailing back and forth to Peggy for further clarifications, I identified the elusive John Fitzgerald, baptised in Killarney on 17 September 1843. Identification of townland and land records followed. William Fitzgerald, John’s father was occupying land in the Parish of Molahiffe in 1853. All of this research and clarification process took up to six weeks. Peggy then made plans to visit, booked her hotels in Killarney, booked a driver, Helena, to take her to Farranfore and to visit the surrounding townlands. Peggy and her husband Boyce Nute, eventually arrived in August and the visit was an outstanding success. 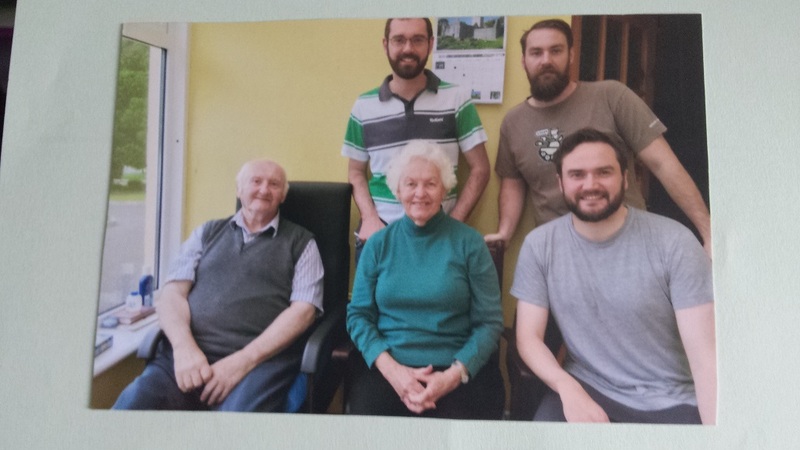 Arriving in Firies and making local enquiries led them to the Fitzgerald family of Gowlane. They were received most hospitably They were treated to tea and members of the family then took them to Molahiffe graveyard and showed them the tomb of their Fitzgerald family. Peggy got phone numbers of other older Fitzgeralds in the parish who were not home at the time and she intends contacting those also. So it takes time, research at home and well-laid plans to locate accommodation for a few days ‘on the ground’ of the target parish. I continually tell descendants that Irish people and particularly Kerry people have no problem at all with genealogy tourists turning up in villages asking questions, one contact will lead to another and another, tea or something stronger will be part of the search experience and you will find your roots and feel part of the great Kerry diaspora. Molahiff is a beautiful, scenic, idyllic graveyard; anyone would be delighted to be buried there – if one had to buried at all….. I e mailed you a few weeks ago about William Brereton killed by rebels while driving a mail coach between Killarney and Mill St. He was buried in a churchyard in Killarney in 1822 and you said you were going to Killarney and would find which churchyard, Have you been there yet? We are not coming over till March but I like to be organised. Sue, I was sure I replied to you saying that it would be extremely difficult to find an 1822 grave in Killarney, if indeed ‘Killarney’ is the correct burial ground. It if it is, then more than likely the burial would be either in Old Aghadoe or Killegy or indeed it could be an outlying area. I have asked the Librarians in the local History section in Killarney if they have any knowledge of it. 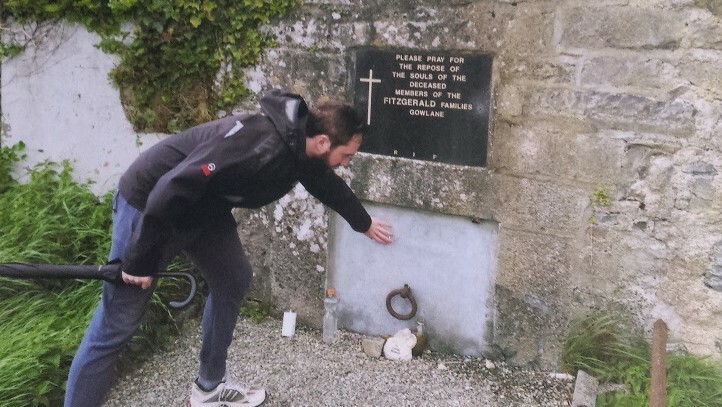 You will understnad that there were very tough times in Kerry in general during the 19th century so a grave that is now 194 years old is not going to be in great condition, or very visible. There are numerous Kerry graveyard overgrown and abandoned after all this time. I will let you know if I get an update. My Father, Thomas Condon was born in Ardoughter Kerry in 1913. I have traced the Condon Name in Ardoughter back to my 3rd great granfather, Patrick Condon ~1784~. Patrick was supposedly born in cork and moved to Ardughter/Cauesway/Clash very young. I have records of his sons John 1818, Patrick 1828, James 1831 and maybe Thomas, Mary and Hanora. I cannot locate Patrick’s ~1784~ wife nor mother and father. If you can email me back I can send you the tree I have as my mothers side is from the same area in Kerry. Nelan (Knoppoge North), Slattery (Clashmealcon). Tom, I would be very interested in seeing your research/family tree. Getting back to 1784 is an achievement! I have conducted research on some of the family names that you have mentioned and its always possible that these families intermarry and thus intertwine. My email address is caballkay@gmail.com. Happy and Healthy New Year. Any luck with the information I forwarded to you? Tom, I am ‘swamped’ at the moment! I have had so many enquiries over Christmas and not able to deal with them day by day due to the holiday/visitor perios. To-day is the first day back at work as it were. Leave it with me and I will be back to you. Stephen, thank you very much for this post. I wasn’t aware of the book but must have a look through it on my next visit to the library in either Killarney or Tralee. Isn’t it a pity that people can’t be trusted to use a book without deciding that they are entitled to tear out pages and remove them! That has also happened to church registers when the priests have trustinly allowed enquirers to peruse the pages without supervision. I just hope that no original registers are allowed to be handled without supervision anymore. I have made some enquiries locally – the book seems to be out of print, I am not sure if it was just privately published and it is not online. I will keep after it. Hi Kay – I have been researching my Cronin Family since 2006. I am finally traveling to Ireland this September, 2018 and will spend 4 days in Killarney and would like to find burial places of relatives (I have identified possible burials in New Cemetary and Killaha cemetaries) and property identified in Griffith’s Valuation. I live in the US and have done a pretty good job identifying many of the family that emigrated to the US. I have information on my great, great grandfather Jeremiah J Cronin born 1812 +/- in Ireland (unable to find a baptism or civil record, emigrated to US about 1850/51) but his brother Bartholomew was born and baptised in Knockmanagh (have foound his baptism record). I have done an exhaustive search trying to obtain information on their father, Michael Cronin and mother, Catherine (Kate) Donnoghue, my great, great, great grandparents. I have identified that many of my family were from Killarney, Knockmanagh and Knocknahoe Townland. As I try to get more information, I wondered is there a better source for info? Findmypast.com or johngrenham.com or another? I have used all the resources on your site. How can I find locations from the mid-1850 Griffith’s valuation? How to find graves in identified cemetaries? Regina, well done on all the work you have completed. Finding graves before the early 1900s though is almost an impossibility. Most people didn’t have money to erext headstones in the 19th century and graves in most old graveyards are overgrown and not possible to indentify. If family stayed on and later generations were buried in the same grave and then erected a headstone, well that is the only way forward. 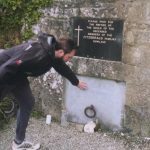 Joe Maher has done a great job going around all Kerry burial grounds and taking photos of the marked graves at http://www.kerryburials.com/ and also Kerry County Council are logging burials in the mid to later years of the 1900s.